I have no idea what is going on with those first floor bricked up areas. The three to the right of the entrance feature the same type of brick as the building, but the ones to the left and the far right are different. The ones to the left are larger also, and almost seem like garage bays. But just look at the detail in the arches as described above! 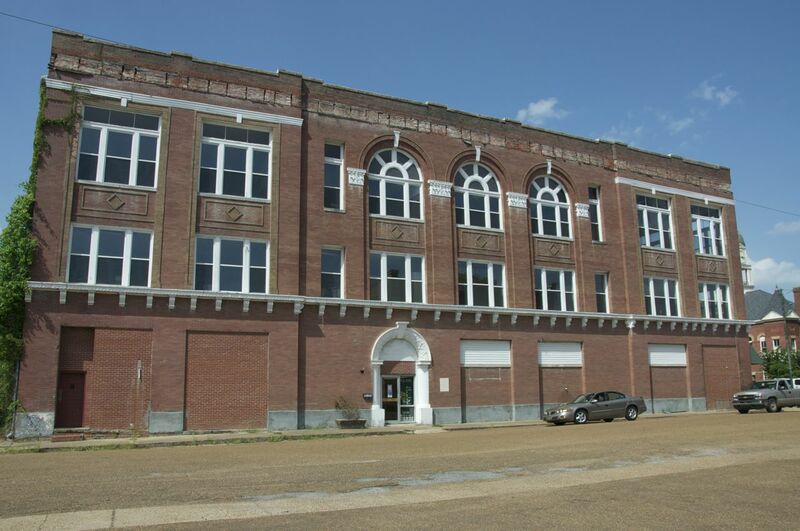 A wretchedly dull, thoroughly graceless one-story, slab-on-grade brick box, typical of the ugly meeting halls erected by small-town Masonic lodges since the 1940s. I had to see what could cause such utter contempt, so I took a Google map drive down Vine Street. I am going to have to agree with the graceless brick box, but then, I guess a meeting hall is supposed to be just that–a meeting hall. Certainly, Penn Jeffries Krouse’s building on Court Square, even in its slightly dilapidated-looking state, retains the grandeur of past architecture. 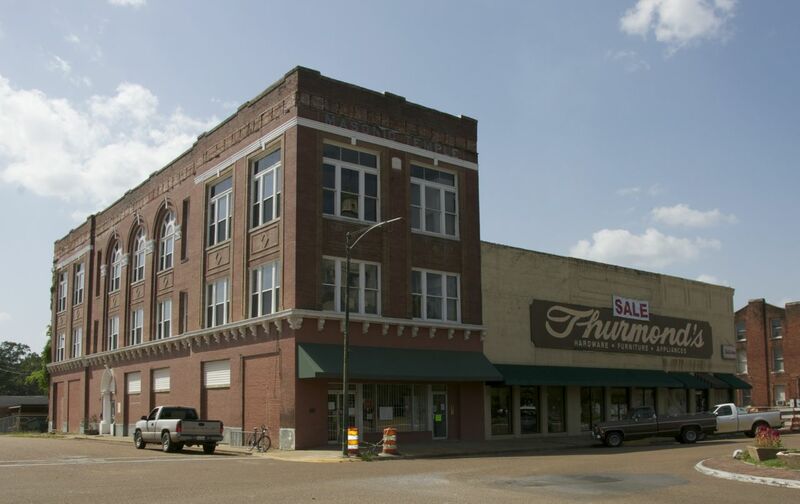 This entry was posted in Mississippi and tagged Lexington Historic District, Lexington Masonic Temple, Penn Jeffries Krouse. Bookmark the permalink. The detail on the arches is stunning. I find it amazing that so much effort and craftsmanship went into details like that. And now, we just slap up plastic columns. Neat post. I would wager that the bricked up bays were at one time wooden(or metal) storefronts. The ones that are only partially bricked up were likely always that way and had ribbon windows. 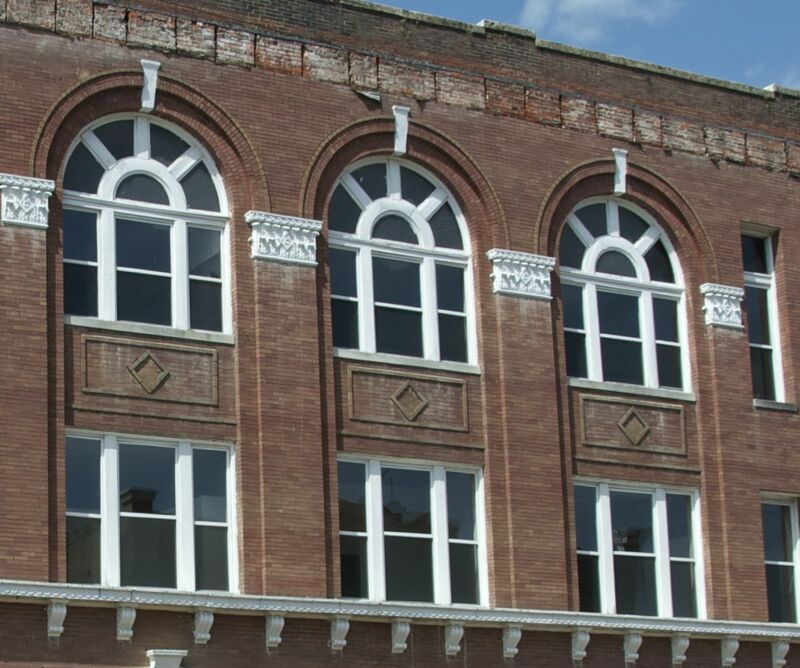 Similar ribbon windows on the Biloxi Masonic Hall. Don’t know who the Biloxi masonic hall architect was. Maybe P J Krouse? Oh, you are so smart!! Of course they would have been storefronts–since the bottom floor was retail space! Certainly bears a resemblance, doesn’t it? I think you might be right about Krouse. Biloxi architect W. T. Harkness sued the Lodge for non-payment of architectural plans he said he provided in 1906, and which were accepted in 1907 by payment of $100 towards the $500 fee. The Biloxi Daily Herald reported December 29, 1911 that plans had been drawn up by a Meridian architect, but did not specify the name. Good sleuthing! I had read about the Harkness fiasco but assumed when the lodge paid up the plans were used and considered the matter closed. With so many similarities between the buildings and your newspaper article mentioning a meridian architect, I would argue for attributing the Biloxi lodge to P J Krouse. Interestingly, a G. A. Harkness was listed as the grand architect at the June 26, 1922 laying of the cornerstone for the new building. Sealed bids for construction were requested in December 1911, and then at the end of the month is when the issue of architect choice came up. I can’t turn up anything else though–maybe later. The Cooper post card of Lexington is also interesting in that the 3 buildings to the right are all still 3 distinct buildings. They were combined over the years into one building and the front windows replaced into a rather unattractive span of glass now. Good if you want people walking down the street to look into your store, but not near as enticing to me as the originals.